Dave has done a number of commissioned pieces featuring the bride and groom dancing, using as a background the sheet music for "their song." These make especially appropriate gifts for the first anniversary, which is, traditionally, the paper anniversary. For someone who has a fondness for a particular make of car, boat, or aircraft, a papercutting of such a vehicle is an excellent gift idea. Silhouetted boats are particularly attractive when placed on maps of the area on which they sail. 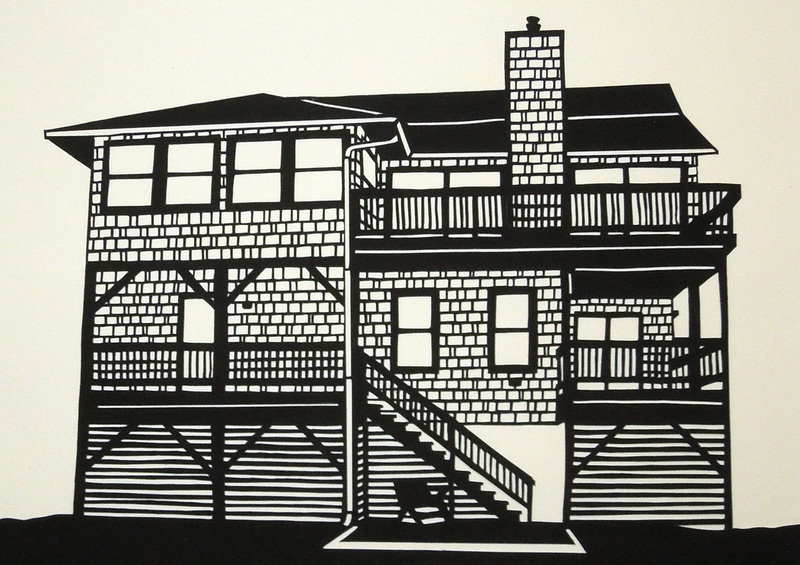 Dave has also worked from photographs to create papercuttings of specific homes. A more expansive option can add to a house cutting the phrase "Welcome to [Family Name]'s House" and incorporate items depicting that family's favorite pastimes and pets. Old photographs, business ledger sheets, or other vintage ephemera from your family can readily be incorporated into a papercutting that will help memorialize these meaningful items for generations. For memorable baby gifts, Dave has cut out the baby's name, linking the letters of the name with floral designs or with animals whose own names start with the letters of the baby's name. To discuss a special papercutting, please go to the Contact page.